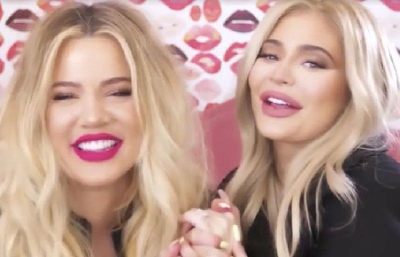 It's been a while since rumours have popped up about the pregnancies of Khloe Kardashian and Kylie Jenner - but this latest story is a gooden. While we wait for either sister to confirm or deny or stop wearing oversized sweats for two seconds to let us know whether the conspiracy of the year is in fact correct or not, Heat magazine has got their own theory that blows the rest of the babies out of the bathwater. According to the publication, not only is Khloe, 33, and Kylie, 20, pregnant and due to become mums in "less than three months" - they're planning a, wait for it, joint birth! lol. Sources say Momager extraordinaire Kris Jenner is hoping for a same-day delivery as both sisters get ready for their due dates. (You know Kris likes to break records). The source adds that acing such a momentous birthing would prove to be ratings gold for Keeping Up With The Kardashians - which, as we know, enjoyed a nice spike in viewers during the episode in which Kourtney gave birth to Mason. However, with the two sisters keeping to two very different style aesthetics in their everyday get up, the publication's source says the ladies are looking for their own brand of birthing suite chic on the big day. They say Kylie "wants a C-section, because she can't stand the idea of all that pain," while Khloe is going more for an "Earth Mother" vibe, adding: "She wants a natural birth, without even an epidural, and she's requested meditative music to be played." So that;s it, time will tell!